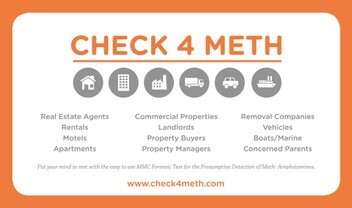 CHECK4METH is a D.I.Y kit totally designed for property screening for Methamphet­amine - not a cheap import or copy. NOTE: these kits are designed for screening testing only. MedNZ Ltd suggests that for any positive screening results you should seek professional advice. MedNZ Ltd hold no responsability for results or usage of product.